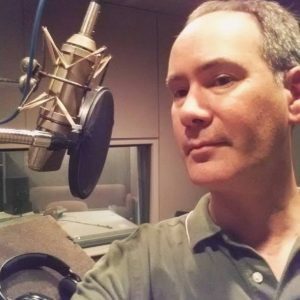 Becoming a voice over talent has been a long but satisfying path with many twists and turns. Yes, when I was young I was one of those kids who made improvised fake radio shows with friends. We’d use a few of our parents’ old portable tape recorders like the Grundig C100 pictured below to create ‘multi-track’ programs. Seeing the needle move on the VU meter when we talked got me hooked on the power of the recorded spoken word. I especially admired poetry. In High School, I was the Editor of the Literary Magazine, where I encouraged students and teachers to submit their works and read them to their classes as well. Afterwards, I studied at the University of St. Andrews in Scotland, where I matriculated with an M.A. in English Language and Literature. A friend’s dad asked me “Do you plan to actually use that degree?” It was a rhetorical joke. I nodded and smiled, replying that I had every intention to use English when required to benefit my career. After university, I worked as a field audio engineer at Cramer Productions near Boston. My first day as an intern was assisting in the studio recording voice overs for Raytheon. Cramer does everything from commercials to nationally broadcast documentaries and large corporate events. We even worked with puppets and llamas! I learned so much about all aspects of production in my nearly ten years there, and it involved a good deal of travel as well – with the most distant shoots in Hong Kong and South Korea. As a recording engineer, I made the scratch tracks for many of our videos and programs. The more I did it and learned from the pros, the better I became at narrating. Eventually, clients were using my scratch tracks as the final version. Finally, when I left Cramer to pursue a freelance career, in the first week I returned to record regional TV spots for them. A year later, and I moved to Atlanta and split my time 50/50 between freelance field audio recording and voice over. It was exciting to market my talents in a new city. I earned my first voice over talents. 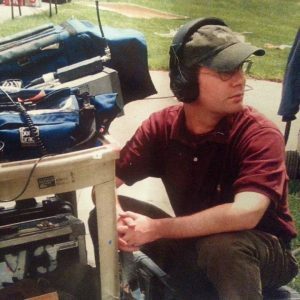 Moreover, I learned even more about production: working on national spots at Turner Studios, PC&E; and as part of the crew on reality shows. Lance Blair at the late, great Doppler Studios in Atlanta. The plan was always to make the big shift to follow my passion for voice over 100%. As soon as I settled into my new home and voice over studio in Georgia, I took the plunge, and I’ve been loving every day. It’s even more rewarding thanks to my talented and helpful colleagues in the Atlanta voice over community. And that’s the journey along my path to becoming a voice over talent. However, the experience has wonderfully global. I never expected this when I first started in my career. Things were different then. ISDN was an absolute must. Now with SourceConnect, Skype, and Session Link Pro I can connect with voice over producers around the world. With those last two options, I can stream two-way broadcast quality audio. I’ve made lasting professional relationships with clients in cities like London, Moscow, Dubai, Oslo, Medellin, Lyon, Munich, Milan, Lagos, and Auckland. And I look forward to working for so many more creative people in the years to come. Thanks for reading about my journey, and find out more about how I’m always learning new things and sharing them at my voiceover blog. Please feel free to download my voice over demos here. And here are some of my clips at Voquent: dry, raw, and unprocessed!